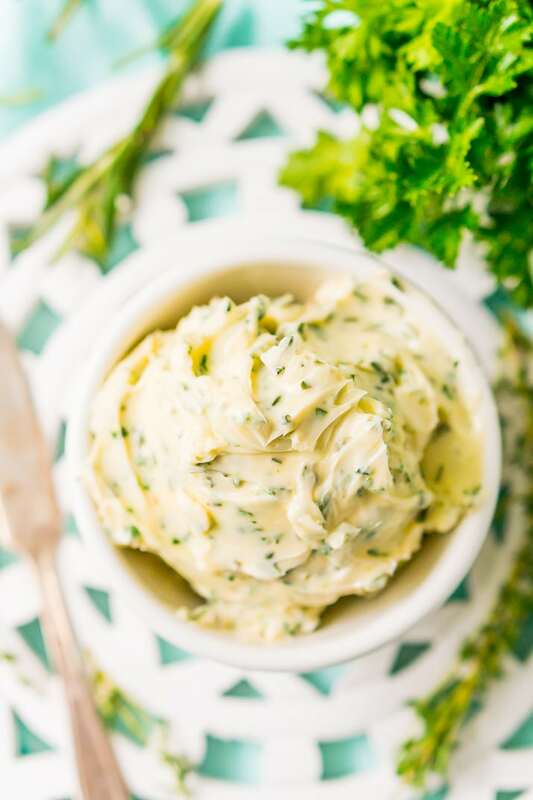 This savory Herb Butter is infused with parsley, thyme, rosemary, black pepper, and lemon zest for a flavorful spread that tastes delicious on garlic bread, dinner rolls, steak, and more! 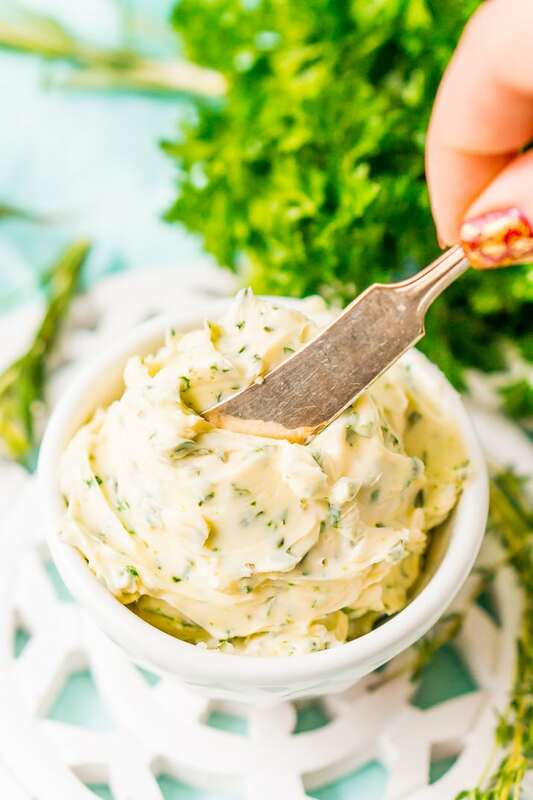 If you want to step up your condiment game for the upcoming holiday season, this easy Herb Butter Recipe will be your new must-have for the dinner table! In addition to toast, rolls, and bagels, use this recipe if you’re looking to add extra flavor to steak or turkey! If those sound good to you, try this deceivingly easy one-pan Epic Rib Eye Steak or my Slow Cooker Turkey Breast! JUST TAKE ME TO THE HERB BUTTER RECIPE ALREADY! 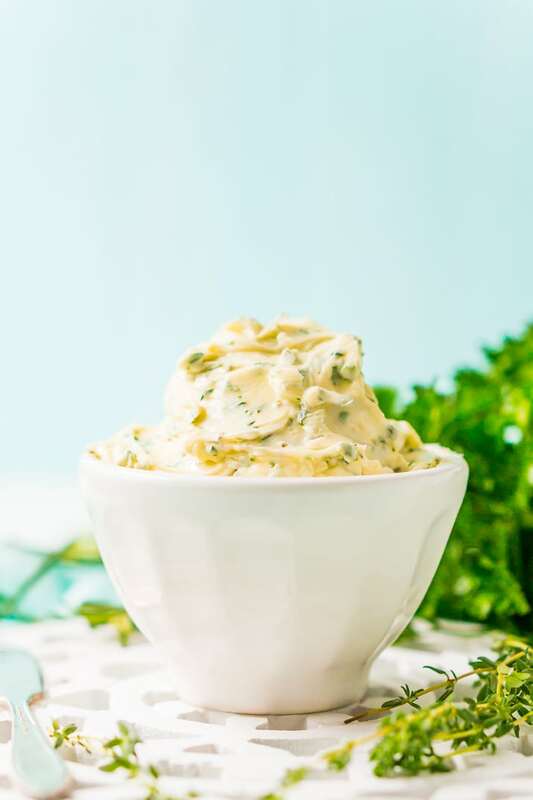 If you’d rather skip my (very helpful, I think) tips and tricks, essential cooking info, and similar recipe ideas – and get straight to this deliciously easy Best Ever HERB BUTTER Recipe – simply scroll to the bottom of the page where you can find the printable recipe card. To make Herb Butter, simply blend salted butter (at room temperature), fresh spices like parsley, thyme, and rosemary, ground black pepper, and if you want, a little lemon zest. Let the mixture sit for a couple hours so all the spices can infuse the butter, and you’ll have a gourmet spread that you’ll want to put on just about everything! 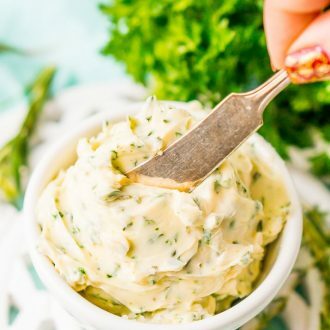 If you love garlic, add ½ teaspoon of garlic powder to turn this recipe into Garlic Herb Butter, a delectable spread that can also be used as a hack when you’re making homemade garlic bread! 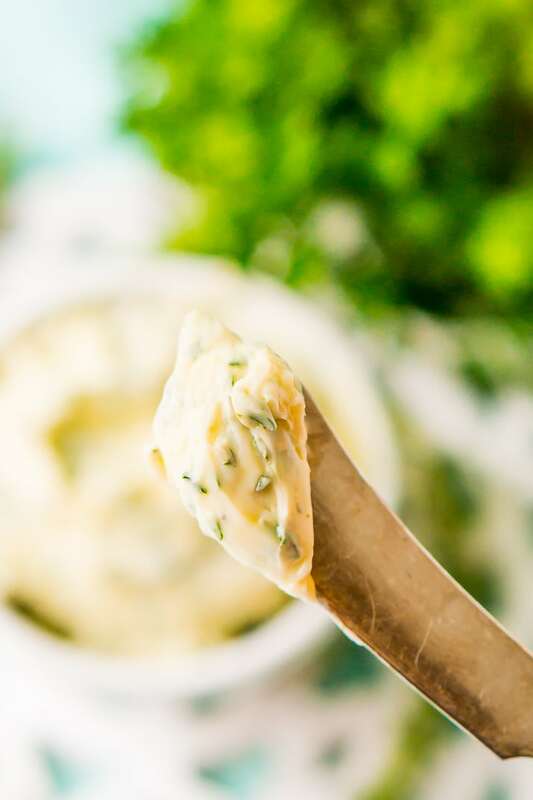 Once you start using this homemade Herb Butter instead of regular butter, you’ll find a lot of tasty ways to incorporate it into your food. For instance, mix a couple tablespoons into noodles and top them with fresh parmesan for a quick dinner when you just don’t have a lot of time to spend in the kitchen. And did I mention that a pad of this stuff makes baked or mashed potatoes especially craveable? 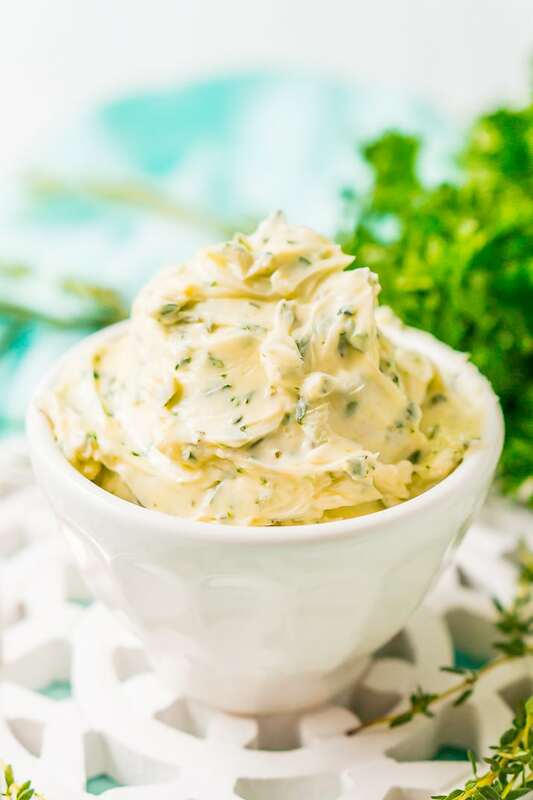 With the holidays just around the corner, you might want to whip up a big batch of Herb Butter to share with friends and family at all your get-togethers. And if you’re responsible for bringing rolls to someone else’s table, don’t forget to bring some of this savory spread to go with it! How Long Does Herb Butter Last? This butter will keep for 5 days in the fridge and 1 month in the freezer. Infusing butter with different herbs and spices is one of the easiest and most delicious ways to add flavor to any dish, and this Herb Butter adds richness to meats and sides. Try this zesty recipe, and you’ll find yourself reaching for it over and over again when the seasonal celebrations are underway! Want something sweeter? Check out this Homemade Cinnamon Butter recipe to pair with rolls, pancakes, sweet potatoes, and more! Pin this Herb Butter Recipe for Later! In a medium bowl, combine all of the ingredients until evenly mixed. Let sit for 2 hours for the herbs to infuse the butter then stir again and either wrap for later use or use right away.